Scuba Shack is located on the beautiful island of Koh Tao in the Gulf of Thailand. A small island, only 23 km2, it is surrounded by amazing coral reefs and crystal clear waters. We have over 25 dive sites all easily accessible and great diving conditions all year round. We are dedicated to giving you the best diving experience possible. Whether you are looking to Give Scuba Diving a Try for the first time, become a PADI Pro, or anything in between, we will always go the extra mile to ensure that everyone has a great time! 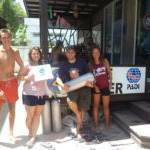 Scuba Shack is a family run business that first opened its doors in June 2014. Since then we have achieved the PADI professional rating of 5 Star Instructor Development Center. Our team of staff have all been working together for many years. Between them have 1000’s of dives on Koh Tao. We can guarantee you the best chance to see all those elusive creatures you’ve been dreaming about. During those years they’ve also taught hundreds of students so you’ll never doubt that you are in good hands with one of our Instructors at Scuba Shack. Koh Tao is an island crowded with dive shops so we know our customers have lots of options, but they also have many reasons to choose Scuba Shack. We offer an attentive and personalized experience so you’ll never feel like you’re just one of the crowd. We only dive in small groups with a maximum of four divers per Instructor or Divemaster. All of our equipment is well maintained and up to date and regularly serviced by our in house technicians. Our purpose built dive boat leaves early in the morning to avoid the crowds from some of the bigger dive shops on Koh Tao. We aim to give each diver as much attention as they need and the best experience underwater during dives. We take customer service very seriously at Scuba Shack, Koh Tao. Our safety record is perfect and we strongly believe in making sure all our customers are aware of the safe diving practices. We have a first aid kit and emergency oxygen system ready on the boat just in case. We all love what we do so much that you’ll usually find most of the Scuba Shack Dive Team still at the shop in the evening. We’ll usually be talking over the day’s dives or just deciding where to go to dinner. Please stop by for a chat if you’re on Koh Tao or Contact Us now for more information! Check out some great pictures of some of the marine life seen here on Koh Tao by clicking on our Gallery. You can also keep up to date with events at Scuba Shack by following us on Facebook and Instagram. We look forward to meeting you and showing our incredible underwater world.